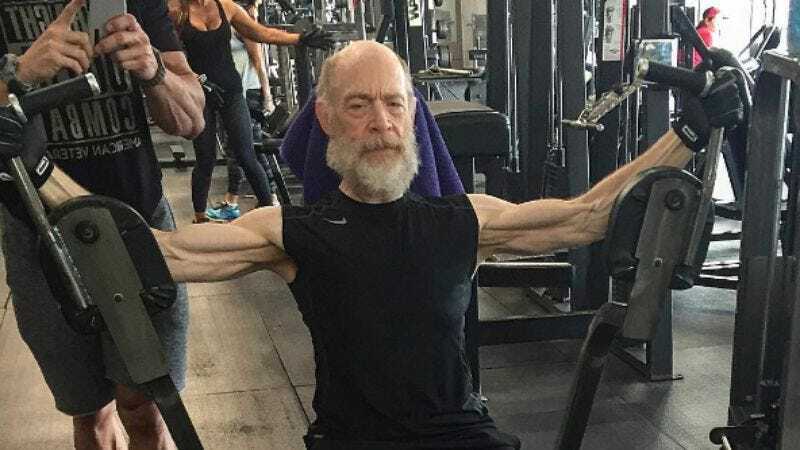 J.K. Simmons is apparently planning to bring some Dwayne Johnson realness to his role as Commissioner Gordon in Zack Snyder’s Justice League. Simmons’ fitness instructor, retired U.S. marine Aaron Williamson, posted pics of the Farmer’s Insurance spokesperson in the gym to his Instagram, and they’re jarringly veiny, to say the least. Simmons, who’s 61, has apparently been spending hours in the gym building muscles upon muscles upon muscles, meaning that when his jacked police commissioner hits Snyder’s over-saturated screen, he’ll be doing so with motherfucking authority. And, of course, with terrifyingly bulging 300-style Greek god muscles. Seriously—these things look like The Rock’s quads on “leg day,” and while muscles are cool and everything, there’s something a little off-putting about seeing so many squiggly ripples on a guy who’s best known for being charmingly affable in movies like Juno. Sure, he showed a different, more sadistic side of himself in his Oscar-winning role in Whiplash, but Jesus. Dude’s jacked.